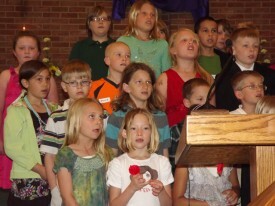 The Seraphim Choir at Cross of Christ teaches children the fundamentals of music and singing through songs that connect to our worship and lectionary teachings. As they continue to learn and grow as musicians and Christians, they learn singing techniques, sight reading, and continue to learn about the imperative role music plays in worship. The Seraphim Choir also participates quarterly in worship services and contributes to our special music programs. Please contact our Minister of Music if you would like to know more about our music ministry.